Risk management is a process of identification, analysis, assessment and prioritization of risk. Risk management software in a business is essential to control threats to a company’s assets, including corporate data, customers’ PII and intellectual. But if you want to minimize your threats and maximize your productivity then you need to analysis the risk factor in advance. That’s why risk management software are relied upon to provide better alternatives of managing risks. These software help you recognize threats and address them systematically to minimize and avoid negative outcomes. Considering the best software may be difficult at times because they do not give you a clear picture of their capabilities. Today here we have gathered for you the list of 10 of the best risk management software and their features that let you narrow down your selection to the most suitable one. 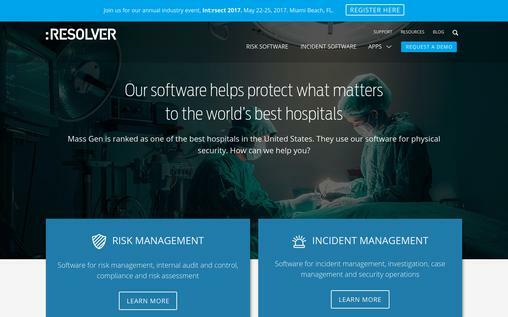 Resolver is the best risk management software for those firms that major in preparation and planning as an integral part of their success. It can be used by a wide range of industries, such as sports, banking, health and fitness, manufacturing, logistics and distribution among others. It is ideal for management of risks at enterprise level, performing internal audits, achieving the compliance regulations and more. Enterprise risk management – this feature makes this software ideal for enterprise level firms to identify, analyze and manage key risks that affect achievement of organizational objectives. Internal audit – Resolver can help your organization assess the internal risks, assurance strategy then create an effective plan and perform audits to ensure that managerial actions are executed appropriately. Compliance management – in a highly strict regulatory environment, Resolver can help you remain compliant with the industry standards and regulations by offering technology strategies to adapt easily. Assessment of risks – Through the Resolver Ballot, you can assess risks that are related to your budget and expenses so as to avoid any possible issues that can during impact your annual operational budgets. Resolver is used by many large organizations across the globe, including TransCanada, OPTrust and HIGHMARK. Pricing plans are offered upon making requests. 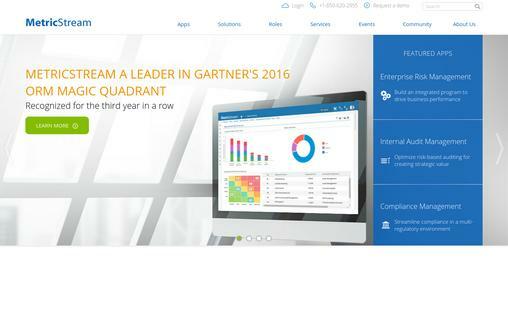 This is a risk management software developed by Qualys and employs the SaaS model to offer compliance and vulnerability management services to its users. It is a combination of PCI compliance, vulnerability scanning, malware detection and web app scanning into one hosted console. Policy compliance – helps organizations comply with the industry standard policies. Vulnerability management – this can help you identify how vulnerable is your firm to threats and presents the most suitable ways to deal with known issues. Malware detection – can easily detect threats that can put a firm’s security at risk and alert you. Security assessment questionnaire – this platform helps you review the important questions that reflect to a firm’s security status and whether the right methods are employed to keep your firm safe. Other features and services offered by Qualys include the PCI compliance, Threat protection, asset view, web application firewall and web application scanning. 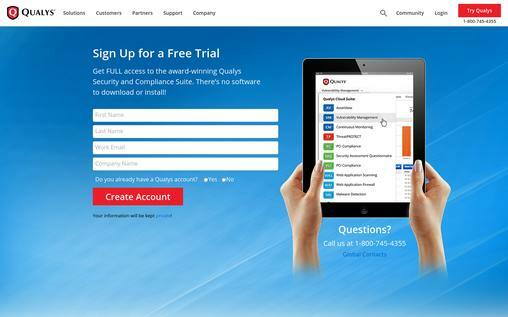 Qualys is trusted by many major global brands including Microsoft, CAT, Facebook, Deloitte and many others. Pricing plans are offered based on the number of users and start as from $2,495 annually which offers the basic services. The $5,495 annual plan offers most of the features of the product including 256 IP scan coverage. There’s also a $6,495 yearly plan with similar features but offering physical scanning appliance. SAS Financial Intelligence is a risk management software solution developed by SAS Institute, designed to offer consolidation, dashboard, budgeting, planning and reporting on a single platform. SAS is designed to be used by Chief Risk Officers and risk analysts for a wide range of firms including manufacturing, banking, and distribution among others. Integrated risk framework – this software has risk engine and risk data model embedded to provide consistency across various portfolios for risk analysts and officers to combine the non-regulatory and regulatory risk analytics. Data management and validation – it comes with a data infrastructure that is self-documenting to help you in data integration and validation from nearly any source. Regulatory analysis & reporting – it has an end-to-end technology platform that supports top-down as well as the bottom-up analysis and then create reports on each. Risk aggregation – SAS lets you accelerate the processing time for simple as well as complex calculations. It allows you to track your performance under various dimensions and portfolios, including pricing libraries and asset classes. Intuitive dashboard – it comes with a simple and easy to use reporting dashboard integrated with the SAS Visual Analytics that allows you to create reports for all stakeholders efficiently and quickly. Some of the top names using this risk management software solution include the Bank of America, RiskTech100 and Discover. 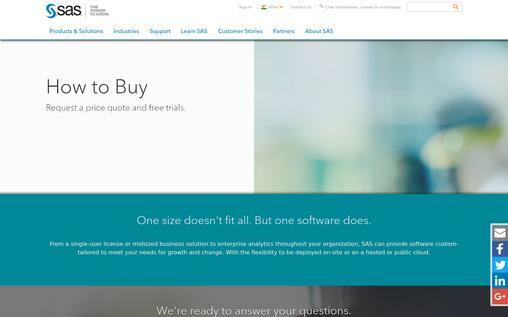 SAS offers licenses for single users, mid-sized and enterprise level users. Pricing plans and free trials are however offered upon making a request. Integrum is a comprehensive compliance, risk and business optimization software solution ideal for use by the small and mid-sized businesses. This software is specifically built for the quality, health, safety, environment management industries, but manufacturing, distribution, supply and contracting industries can also find very useful. Business optimization – this feature is aimed at maximizing the activities that directly impact your business performance such as HR functions, suppliers and contractors, tasks and action workflow among others. QHSE Risk & Compliance – this is directed towards identifying potential risks and compliance loopholes through controlled document management, incident and investigation management, compliance management and risk & control management. BI Reporting – this is a world class reporting system equipped with drag and drop reporting capability and dashboard. 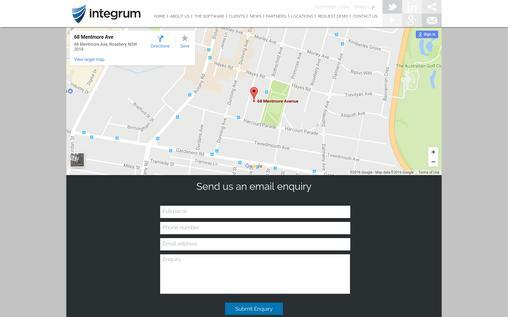 Mobility – Integrum provides flexibility in terms of access as it also offers business intelligence apps, incident and inspection audit apps for both iOS and Android platforms. Their pricing model is offered on a subscription plan with free trials included. Pricing quote are however issued upon requesting a demo. It is trusted by major brands across various industries including Coca-Cola, Jetstar and Westfield. MetricStream offers a flexible and integrated solution for documentation and assessment of risks, audit management, controls definition and implementation of remediation plans. It enables an organization in identifying, assessing, quantifying, monitoring and managing their IT and operational risks through an assessment driven approach. Risk Management – it provides visibility into the risk exposures and status so you can effectively manage your firm’s long term plans and strategies. Compliance management – this is driven towards helping firms reduce their compliance costs through integrated corporate governance. Business performance – this presents a robust way of managing internal controls to strengthen your business operations and performance. Policy management solution – offers a flexible platform for streamlining the management of the corporate policies to enhance accountability and communication. Multiple hosting solutions – it’s available as an in-house platform and cloud hosting solution. It is available as N-tier web application and as a built on standard, like XML and J2EE. MetricStream Risk Management Solution is offered at three pricing models in terms of deployment: for small enterprises at $75,000 to $150,000 per year, medium enterprises at $250,000 to $500,000 per year and large enterprises at $750,000 to $1 million per year. 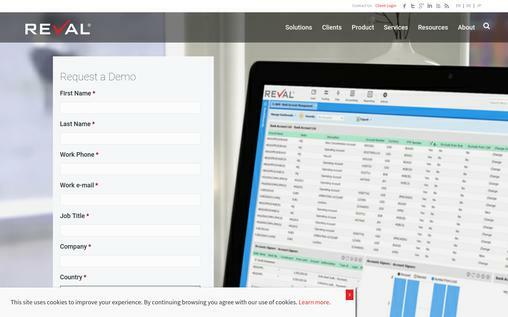 Reval is one of the top global treasury and risk management software solutions offered on a SaaS platform. This integrated risk management software can be used by firms to optimize their treasury activities and manage risks to achieve better operational efficiency, control, security and compliance. It’s ideal for banking and other financial institutions but is also suitable for manufacturing, distribution, supply and contracting firms. Financial risk management – this allows firms to manage their exposures in a holistic manner and protect themselves from uncertainty and volatility. It gives you the power to control risks in interest rates, foreign exchange and commodities. Hedge accounting and compliance – Reval can help firms navigate the maze of compliance regulations such as ASC 815 and ASC 820-10 among others. The hedge accounting capability automates and centralizes the reporting and documentation process. Liquidity analysis – this is an effective cash management platform that allows companies to get a real time visibility on their global cash status. It achieves this through its bank connectivity capability that gives insights on liquidity risks and cash positions. It provides highly sophisticated and customizable functionality for treasury services such as investment sweeping, cash forecasting, financial risk management, core cash risk management, hedge accounting and compliance. Pricing plans are offered upon requesting for a demo. Optial risk management solution lets you carry out easy identification, assessment, monitoring and mitigation of risks in your firm to establish an effective way of achieving your organizational objectives. Optial can be used across a wide range of industries including banking and finance, manufacturing, supplies and contracting and many more. Risk registers – this lets you employ various approaches towards identifying and mitigating risks. Risk assessment – allows you to generate reminders and email notifications on any risk assessments that are incomplete. You can also record the likelihood and the exposure values at inherent, residual as well as target risk levels. Risk analysis – lets you define the possible risk scenarios and determine the impacts, costs and probability associated with certain risk events then determine the best techniques of mitigation. Reporting – Optial gives you a wide selection of the reporting options to get a comprehensive overview of current and historical trends in your data. Reports can be exported to Word, Excel and PDF. Flexible solutions – Optial gives you configuration features such as backwards compatibility and front end configurations so you can tailor what you need for your business. 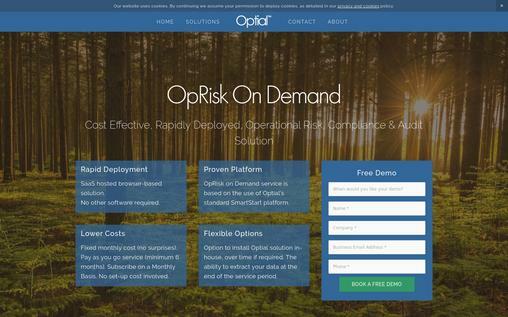 Optial is offered on a subscription pricing where users can subscribe for a minimum of six months and a monthly subscription plan. Price quotes are offered when you book a demo. 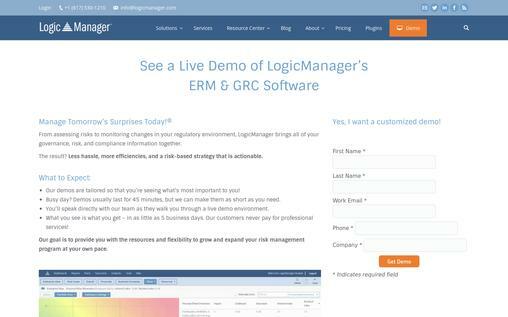 LogicManager is yet another exceptional enterprise risk management systems available in the industry. It comes fully featured with useful features that make it ideal for a boundless number of industries. LogicManager has been built to be suitable for small, medium and large scale enterprises. Risk assessment frameworks – this offers a standard approach of conducting enterprise risk assessments ( such as COSO, ISO, OCEG) by objectifying all assessments to ensure all departments coordinate effectively. Risk analysis – you can easily identify risk indicators, financial scenarios among other metrics related to risks and business processes. Incident management – the process of incident management is streamlined and centralized so you can determine the best remediation actions to take to achieve configurable workflows. Risk reporting and dashboards – allows you to come up with as many custom dashboards as possible through the in-built reporting engine. This ERM software provides contents and resources required to achieve success for all sizes of business enterprises. LogicManager offers their pricing plans upon request. You can also request for a live demo. 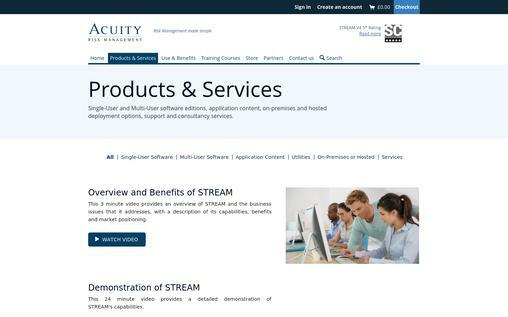 STREAM Integrated Risk Manager is developed by Acuity Risk Management, specially designed to allow small to medium sized enterprises apply GRC so as to improve their risk posture. It’s an ideal risk management software with excellent actionable information on cyber-security compliance among other risk management issues. STREAM can be used across various industries such as banking and finance, manufacturing, contracting and IT firms. Some of the top users of STREAM include Central Bank of Lesotho, NHS Wales Informatics Service and LSG. Cyber security GRC – this helps organizations stay up to date with cyber security compliance requirements and risk status. Risk analysis – STREAM makes it possible for security operation teams to prioritize and automate their operational activities towards a better and informed decision-making process. It uses data from various technologies to create functional workflow. Intuitive dashboards – STREAM’S dashboard gives a good graphical appearance and look into a firm’s risk posture. Threat and vulnerability tests – allows multiple ways of data input so users can easily inspect the various sources from which risks emerge and the best way to address them. Acuity offers a flexible pricing plan, which is great for small and medium sized businesses. Affordability is perhaps what makes it, more likable. 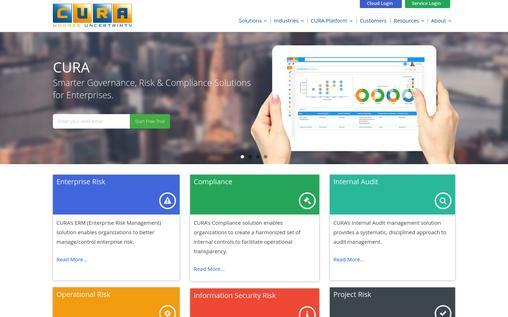 Cura offers governance, risk and compliance management solutions for a wide range of industries, including the finance and banking, insurance, energy and utility firms, mining, healthcare and many more. It features a number of useful applications that make it ideal for small, medium and large sized firms. Internal audit management – this is offered through Cura Audit, which provides a disciplined and systematic audit management approach. It empowers firms to assess risks, schedule audits, create and maintain long term audit objectives. Dashboards and reporting – Cura is equipped with highly customizable dashboards through which users can create various reports to meet their business needs. GRC management – helps you identify risks, regulatory requirements and what needs to be done to effectively remain within the governance and compliance requirements. Surveys and self-assessments – organizations can perform surveys and assess their own performance in relation to their organizational objectives. Enterprise risk management – can aid in identifying various potential risks, such as project risks, information security risks, operational risks and the best approaches of mitigating them. Flexibility in deployment – Cura offers users the cloud and in-house deployment options. Pricing plans and more information regarding how organizations can best use this software, users need to schedule a demo. Most of these risk management software offer their pricing plans and detailed information on usage upon requesting for a demo. To get a better understanding of how a particular software might benefit, you, you might want to visit the developer’s website and request for demo. From there, you can easily note if it will be useful to your organization needs.